The September Job Openings and Labor Turnover Survey (JOLTS) data released yesterday showed job openings falling as hires rose. Over the business cycle thus far, both opening and hires fell dramatically over the recession, then have been climbing back up throughout the recovery. What’s striking from the first figure below is that openings fell at a faster rate than hires during the recession and have also returned at a faster rate over the recovery. 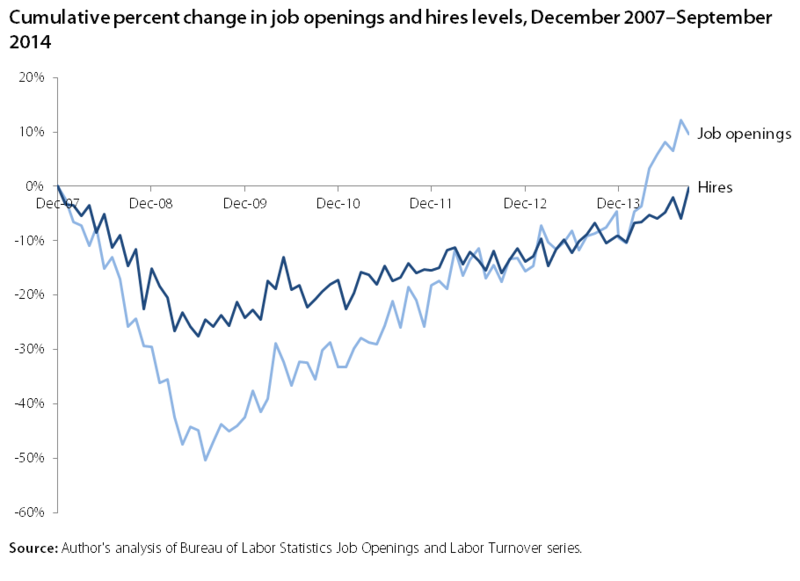 Both are now at least back to their prerecession levels, and growth in openings has now overtaken growth in hires. However, returning to their immediate prerecession levels is not a particular milestone, because it fails to take into account the growth in the working age population. The recent excess of openings over hires has led some to infer that this suggests a shortage for some types of workers, and evidence that a mismatch between workers’ skills and employers’ demands has become a key labor market problem. We should note that there are substantial other pieces of evidence that are inconsistent with this “skills mismatch” theory. For example, there are still 2 unemployed workers for every job opening in the economy. And, there are no sectors where jobseekers outnumber job openings. That is pretty strong evidence against any shortage of skills in the economy today, but the gap in the growth of opening and hires have led some to suggest that there is a one. We decided to take a closer look at this, and the evidence is solid. If we look more closely at the relationship between openings and hires by sectors, we once again see a strong case against any sort of skills mismatch. We separated out the retail trades and accommodation and food service industries— which typically pay lower wages, have a less-credentialed workforce, and are generally not thought of as particularly skill-intensive—from other sectors. 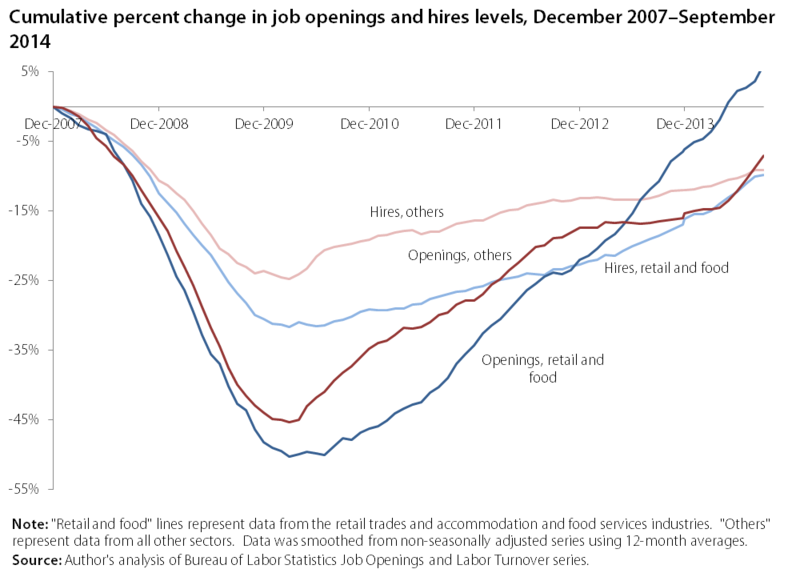 In the figure below, the blue lines represent openings and hires in these two lower-skilled industries, and the red lines represent all other industries. Following the general trend seen in the first figure, openings in the two low-wage and low-credential industries suffered a major loss in the recession but have rebounded quickly, even outpacing hires growth since November 2012. But this trend is less pronounced in all other industries, with job openings growth returning more slowly and only overtaking hires in August 2014. Compared to their pre-recession levels, job openings in the low wage industries are up 6 percent since the recession, while job openings in all other industries are still down 7 percent. If we are to take the gap between openings and hires as evidence that employers are having trouble finding workers with the right skills, then that difficulty is most prevalent in sectors that arguably require fewer credentials and clearly pay lower wages. This is odd evidence to cite in favor of a skills-mismatch in the economy.